c) Add new features or amenities to the property (i.e. dishwashing machine, in-suite laundry, etc.). In theory, a retrofit should be completed when the incremental value created by the retrofit exceeds the present value of its cost. Let’s break this down. How do we estimate value? 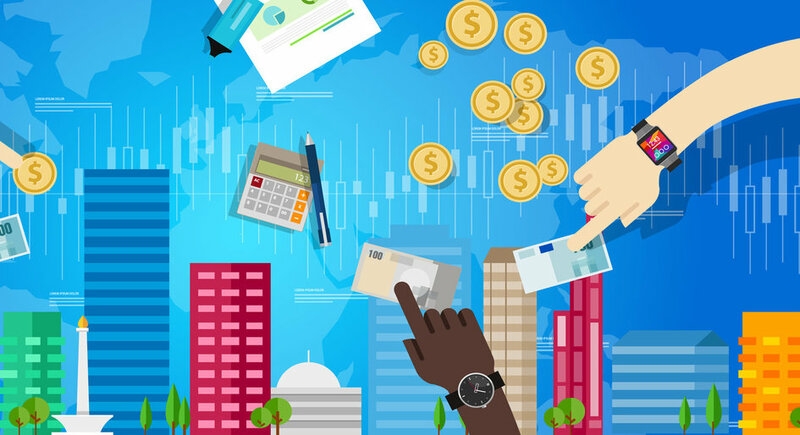 Investors often make the mistake of thinking the cap rate and NOI are two independent variables that can be estimated in isolation of one another. In reality, the relationship between the two is a complicated one. For example, a capital expenditure, like a new roof, might enhance the economic life of a building although it may do little to increase rents. If the NOI doesn’t change as a result of the new roof, does that mean the property’s value doesn’t change either? In all likelihood the cap rate would be adjusted downward to reflect the incremental value added by the new roof, but by how much should the cap rate be adjusted downward? How do I calculate the present value of the retrofit costs? Are there any financial incentives being offered by government or industry that can potentially offset your up-front costs? Are these incentives paid in a lump-sum up-front payment or are they received over time in future years? Have you included a management fee to reflect your time and expertise in executing the renovation project (i.e. obtaining permits, obtaining quotes, hiring trades, managing trades, etc.)? Has lost rent throughout the renovation project been accurately accounted for? Are there rent controls that may limit how much and when you can increase rents? How will your property assessment, and hence property taxes, be impacted? How will your property’s post-retrofit average rent and operating costs compare to the broader market? The following analysis compares the property’s current ‘as-is’ value against its ‘as-renovated’ value based on Renovation A and B. 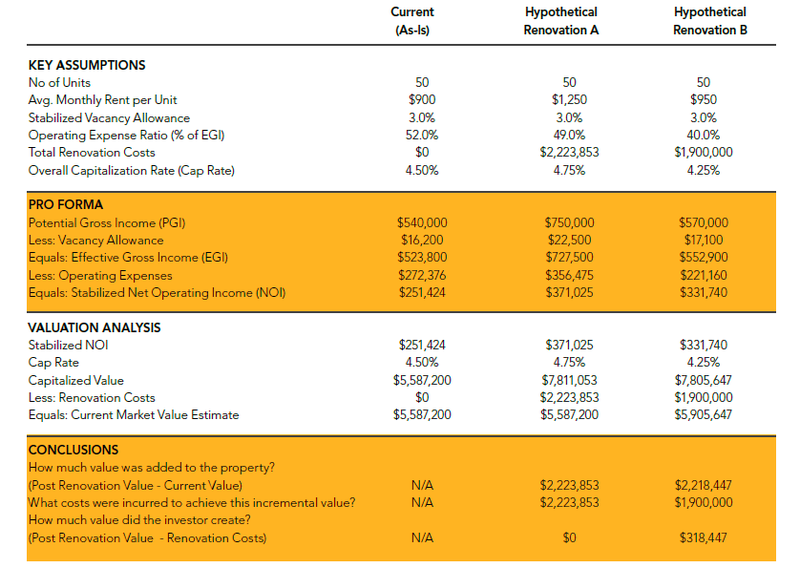 Note the average rents and operating costs are different in each scenario, as is the cap rate. In short, a higher cap rate for Renovation A reflects the added risk of targeting the small ‘high-end’ segment of the market whereas the cap rate for Renovation B accounts for the relative safety of having rents at current market levels, plus the expectation of no major capital expenditures over the near term. 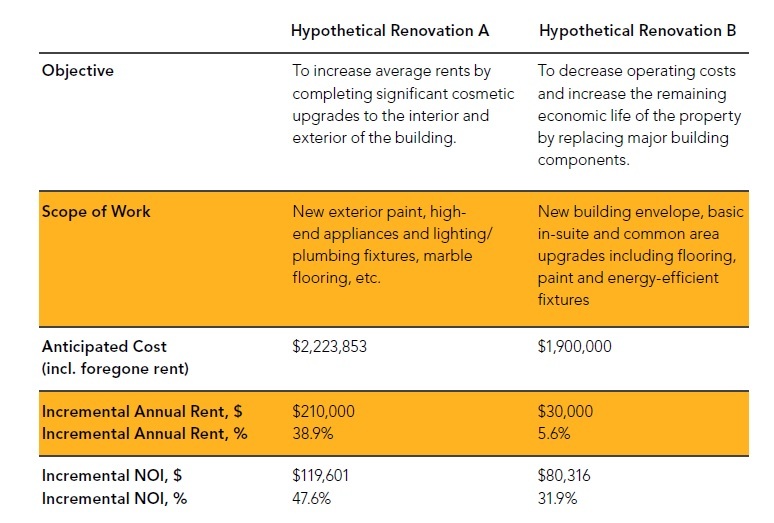 Both Renovation A and B increase the value of the property but only Renovation B results in an increase in value. In other words, the value added to the property in Renovation A equals the cost of Renovation A, meaning there is no excess cash (profit) left for the investor (assuming no fees are included in the renovation cost). Would you invest $100 to receive $100 in return? Probably not. On the other hand, Hypothetical Renovation B created over $300k in value. Should the investor undertake this project? What if the investor created $200k in value, should he or she still undertake this renovation project? The answer to this question depends on internal factors specific to the property and external factors related to the broader market. In the end, spreads between cost and value provide investors with opportunities to make profitable investment decisions. Understanding how and why cost and value may be different is, in large part, what differentiates successful investors from the rest.